The home side included Murugan Ashwin in place of Varun Chakravarthy, while the visitors went in with an unchanged line up. After being sent into bat by Ravi Ashwin, Mumbai Indians opening pair of Rohit Sharma and Quinton De Kock got off to a great start as the duo added 51 runs for the first wicket, before Hardus Viljoen trapped the MI skipper leg before wicket for 32 runs. Suryakumar Yadav after scoring two well timed boundaries was caught plumb in front in the seventh over off the 28 year old Ashwin. Yuvraj Singh and De Kock anchored the innings with an 58 run stand, before Mohammed Shami claimed the prize scalp of the the former for an attractive 60. The 37 year old Yuvraj and Kieron Pollard failed to deliver with the bat, as Mumbai Indians from 120 for 2 slumped to 146/5. Hardik Pandya’s handy cameo of 31 off 19 balls, helped Mumbai Indians reach a competitive score of 176/7 in their allotted 20 overs. The pace trio of Shami, Andrew Tye and Viljoen claimed 2 wickets each, while leg spinner Murugan was the most successful bowler with figures of 2/25 from his four overs. 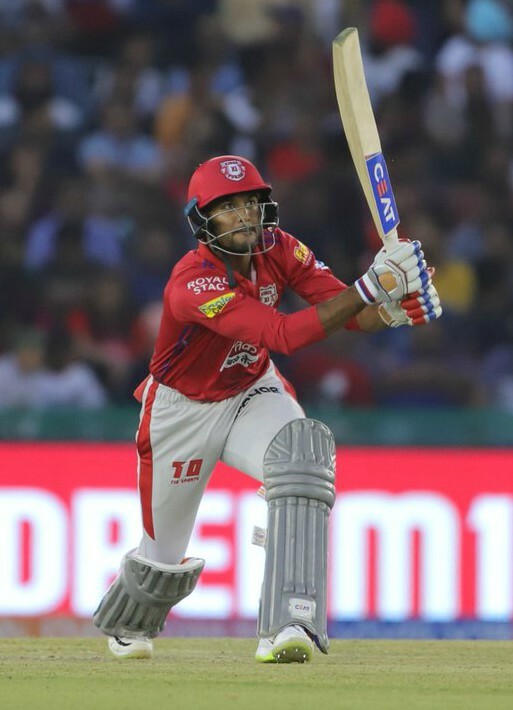 Chasing a target of 177, Kings XI Punjab made a good beginning as Chris Gayle and Rahul added 53 runs for the first wicket, before Gayle’s blitz was ended by Krunal Pandya in the 8th over. After the dismissal of 39 year old Jamaican left handed batsman, Mayank Agarwal took the attack to the Mumbai bowlers by smashing them to all parts of the ground, before being dismissed caught and bowled by elder brother Krunal for a brilliant 43. David Miller along with the former put on an unbeaten 60 run stand for the third wicket, as KXIP reached the target of 177 with 8 balls to spare. This was Punjab’s second win in three games while MI lost their second game. Mayank Agarwal was declared the player of the match.